With HeartStart FR3, Philips is raising the bar for AEDs. * Data on file with Philips Healthcare. **If you do not use a Philips HeartStart FR3 carry case, with the auto-on feature, press the green On/Off button to turn on the FR3. Not all items are available worldwide. Check with Philips for availability of optional software and accessories. The FR3 requires a prescription for use in the United States, and must be used under medical direction. Philips and our network of dealers offer AED/CPR training courses to help responders become skilled at integrating Philips AED use with CPR and first aid. And Philips offers a variety of information resources aimed at building knowledge about using our AEDs and putting together an effective AED program. Consulting services to guide you in putting together and manage an outstanding early defibrillation program. The Pads Sentry is designed for use in the Philips FR3 carry cases, and provides support for the fast response features available on the Philips SMART Pads III. Once the pouch has been removed from SMART Pads III, they can be inserted into the Pads Sentry making them ready for fast deployment. The Pads Sentry also enables SMART Pads III to be tested when FR3 does its routine self-tests. Stores 8 hours of ECG, patient event data, and including 8 hours of voice recording for download and retrospective review. Required when using FR3 Bluetooth Transceiver Module & some computer systems. 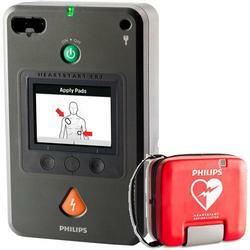 This is the secret that makes the Philips HeartStart FR3 AED so cost effective to own. Other AEDs use pediatric electrode pads for use on children. It means youll have to regularly replace them just like adult electrodes pads. The FR3 uses a "key" that when inserted into the device, converts the FR3 into a pediatric defibrillator. The Defibrillator Cabinet, constructed of heavy gauge steel and tempered glass, protects your defibrillator from theft and the elements. Equipped with an audible alarm and flashing lights (powered by two 9-volt alkaline batteries), the Cabinet attracts attention to mobilize assistance during a cardiac emergency or deter theft. Opening the Cabinets door activates the audible alarm and lights. For locations where a siren is inappropriate, the audible alarm can be disabled. In buildings with a central security system, your facilities people, or alarm company, can connect the cabinet alarm to your system for a more coordinated response to a cardiac emergency. The alarm can also be connected to a programmable auto-dialer. * The Americans with Disabilities Act requires that objects not protrude more than 4 inches into foot traffic areas of open aisles and walkways unless the objects bottom edge is no higher than 27 inches from the ground. The Wall Mount Bracket is designed specifically for housing a Philips HeartStart defibrillator and its accessories. The defibrillator’s carry case can be tethered to the Wall Mount Bracket with a breakaway Secure-Pull Seal (M3859A) to discourage tampering. A broken seal indicates that the defibrillator has been removed from the Wall Mount and accessories may need to be replenished. The Fast Response Kit (68-pchat ) tucks neatly behind the Defibrillator Case. Easy-to-understand graphics raise awareness of passers-by about how to use an AED in an emergency. Great for office settings, sports clubs, public facilities, school settings, and more. Place these posters away from the AED, in break areas, copy rooms, or locker rooms – anywhere that employees or members of the public can take a moment to raise their awareness about AEDs. 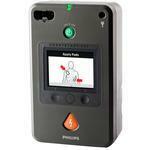 Includes space for the AED coordinator to write-in the location of the nearest AED. Pack of four posters, 2 each of (Are You Ready?) and (Its Easy as 1-2-3). Philips HeartStart FR3 Defibrillation Electrode Pads are general purpose pads for use with Philips HeartStart FR3 AEDs. They replace the electrode pads you originally received with your Philips Heartstart FR3 AED.